Infant Toddler Family Day Care partners with Child Care Aware of Virginia to operate Child Care Aware of Northern Virginia – a child care resource and referral service that provides parents with basic referrals to childcare providers and offers training and support to caregivers. As a member of Child Care Aware of Virginia, our service area includes the following counties/cities: Alexandria City, Arlington, Clarke, Culpeper, Fairfax City, Fairfax, Falls Church, Fauquier, Frederick, Fredericksburg, Greene, King George, Loudoun, Louisa, Madison, Manassas Park, Manassas, Orange, Page, Prince William, Rappahannock, Shenandoah, Spotsylvania, Stafford, Warren and Winchester. Click here for more information about Child Care Aware of Virginia and to view a map of Virginia counties served by the regional child care resource centers. If you are looking for care or assistance in a different area, please contact Child Care Aware of America at 1-800-424-2246 to find your local child care aware agency. Child Care Aware of Northern Virginia provides training and FREE technical assistance to child care providers. Technical assistance to child care providers includes information and resource materials about child development, nutrition, child care regulations, professional development, accreditation, quality enhancement and other child care operation issues. If you are interested in receiving training/technical assistance, please contact Child Care Aware of Northern Virginia at 1-877-321-0997. Child Care Aware of Virginia is a site to help you know and understand decisions being made at the local, state and national level that will impact your family, your children and your community. This site will provide you with information to allow you to become the lobbyist for your family with your elected officials. Child Care Providers – Looking to grow your child care business? Child Care Aware of Virginia helps parents in our community by providing free referrals to child care and preschool programs. This free service helps families, and it can help you to expand your business and advertise your program, at no cost to you. If you are a local child care home, day care center, preschool or a before/after school program in our service area, please complete our Program Profile Form to be added to the Child Care Aware of Virginia Online Database. Your information will be used to generate referrals to parents looking for childcare in your area. The service is FREE. Do you care for young children of military families? Here is a good resource – Booklet for Civilian Child Care Providers. Parents – Searching for Child Care? Child Care Aware of Virginia provides you with individualized referrals to over 1200 local child care homes, centers, preschools or before/after school programs. These referrals are FREE to the public and include a search for providers based on your criteria, information on choosing quality child care as well as information on child care regulations. If you are a military family looking for child care, you may qualify for child care subsidy. Please visit the Child Care Aware of America Military Page for more information. Child Care Aware of Northern Virginia is a member of Child Care Aware of Virginia, and child care resource and referral services in Virginia are funded, in part by the Virginia Department of Social Services. 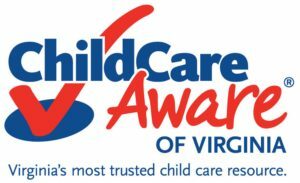 For more information about Child Care Aware of Virginia, please visit their website at www.va.childcareaware.org. Child Care Aware of Northern Virginia partners with The Childcare Network to deliver the Child Care Aware of Virginia’s Scope of Services. Any views or opinions presented by Infant Toddler Family Day Care (ITFDC) as a contract organization of Child Care Aware of Virginia (CCA-VA) are solely those of ITFDC and do not necessarily represent those of Child Care Aware of Virginia or Child Care Aware of Northern Virginia. A child care resource and referral agency is not a licensing agency. We cannot make sure that a child care provider follows licensing standards. WE CANNOT SUGGEST ANY CHILD CARE PROVIDER. WE CANNOT RATE CHILD CARE PROVIDERS. You should visit many providers to find out what is best for your family. You can decide if a provider offers the services you need.